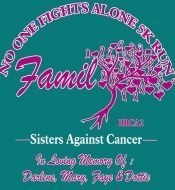 It is in honor of four sisters that fought long and hard battles against cancer. Faye Garis, Mary Lomiosn, Darlene Boone, and Dottie Butts. They all four lost their lives to this horrible disease way to early in life.